The first question to ask yourself before you start blasting pesticides around is where did they come from. Make sure your pets are up to date with their treatments, when we talk about flea treatments we mean a prescription treatment from your vets not the permethrin drops from the pound shop :). Even if they are its worth while talking to your vet as resistance to some prescription flea treatments is now a problem and many vets are now switching to different products. The flea treatment process is simple and involves the application of a professional use only residual insecticide. it is usually cheaper to call a professional to undertake a treatment than to use dozens of cans of non residual product as supplied in supermarkets and pet store. 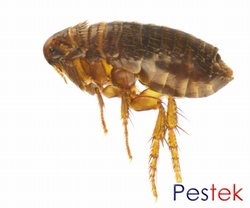 Flea's generally lay four to eight eggs at a time following a blood meal, laying hundred during their lifetime. The eggs are frequently found in or around pet bedding as well as in cracks and crevices / carpet edges where pets sleep or frequent. Adults usually begin to seek a blood meal on the second day of emergence, and although they have a preferred host usually a cat or dog, they will readily bite and can survive using other species as hosts.